Offering a roller coaster ride filled with excitement, twists, and turns, Ignition Casino showcases a wild collection of fun casino games for members from a wide variety of locations. This site might be a relative newcomer, but it delivers everything you need and want in an online gambling experience. 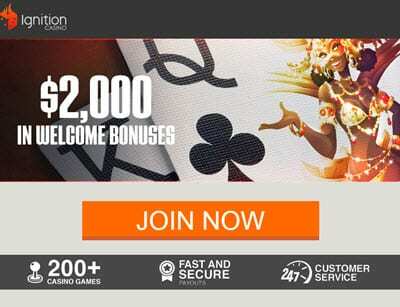 Ignition Casino Welcome Bonus up to $1000 | Software: Real Time Gaming and Rival. IGNITION CASINO play now ! Ignition Casino is currently powered by Real Time Gaming and Rival, creating an exciting place to pull up a virtual chair and spend a few hours. While Rival is known as a smaller entity, it is just as agile in creating casino games for online casinos. Real Time Gaming is perhaps more well-known, and it delivers a welcome selection of exciting virtual games as well. Both instant play and downloadable options are featured at this online venue. A generous 100% match bonus for casino games is available for players who wish to take advantage of it. This bonus is good up to $1,000. Of course, it is important to state that this bonus is only available on a player's first deposit. Best of all, this bonus is cashable as well as playable, so you can really make out fairly well with this particular bonus. Of course, a few requirements are in place, preventing you from simply taking the money once you deposit funds. For example, players must play 25 times before attempting to withdraw any money, and they must also avoid certain games that do not count toward meeting these requirements. This casino is regulated through Kahnawake Gaming Commission, an entity situated in Canada. This commission continually regulates the activity of this gaming website to ensure it is following the guidelines in pace for this type of activity. Currently, members must be from the United States of America in order to play at this site. Ignition Casino currently offers a varied selection of slots, adding up to a couple of hundred games. Many of these feature standard three-reel versions, while other slot games offer five-reel scenarios. Titles are typically creative, while game play is usually fun, endearing this website to the hearts of players of all ages. In fact, many of the games found on this casino website feature intriguing story lines, adding to the thrill of trying to win a huge jackpot or two. Currently, a number of games are outpacing others in popularity. They include: Cleopatra's Gold, Indiana Jane, Vintage Vegas, Caesar's Empire, Golden Gorilla, Major Moolah, Aztec's Treasure Slot, and As the Reels Turn. Table games are equally popular among players. They include baccarat, blackjack, craps, European roulette, American roulette, rummy, and a variety of poker games. Since video poker is so popular, Ignition Casino also offers a good selection that features multi-handed versions as well as single-handed ones. This collection includes such well-known games as Bonus Poker, Loose Deuces, Bonus Poker Deluxe, Double Jackpot, Jacks or Better, Double Double Bonus, and Deuces Wild. Members can also enjoy a number of entertainment options outside of the regular gambling options. For example, Sudoku, Keno, Bingo, and a variety of scratch-off games are offered throughout the site. As an additional precaution to maintaining high security standards on the website, Ignition Casino might require members to verify their accounts by providing specific information once or twice a year. Unfortunately, when this occurs, it can take as long as two full days for the verification process to reach completion. Ignition Casino accepts Visa, MasterCard, and American Express for deposits, providing credit card users with a convenient way to put money into their accounts. Ever growing in popularity, bitcoin is accepted for both withdrawals and deposits. Withdrawals can also be made through credit card and check. Currently, withdrawals take between three and ten days. Minimum and maximum deposit and withdrawal amounts are in place and vary according to the method being utilized to transfer funds. Representatives are available 24 hours a day, seven days a week, to answer any questions members have regarding deposits, withdrawals, game play, accounts, and more. In addition to live chat, customer service representatives can be reached through email and phone. The phone number is toll-free, so no fees are incurred when using it to contact customer service.